And now she knows what she needs to work on. I won't speculate as to what caused her to fizzle out on her second vault. Pressure? Nerves? Overconfidence? It can't be the lack of a podium one-touch warmup, because the first one was great. But I would like to point out that for vault, more than any event, allowing each gymnast a quick run or two would be a wise nod to athlete safety. When spatial awareness is of the utmost importance, imagine the difference going from the floor of a warm-up gym to an elevated podium in a massive arena. Then you'll hit a springboard that sees less use than the one in the warmup gym, and may be a little tighter--for better or for worse. My second safety concern is for Yamilet Pena Abreu and anyone who takes a cue from her strategy. Before the Games, I read one of those articles about gymnastics where the sport's jargon is consistently misused. 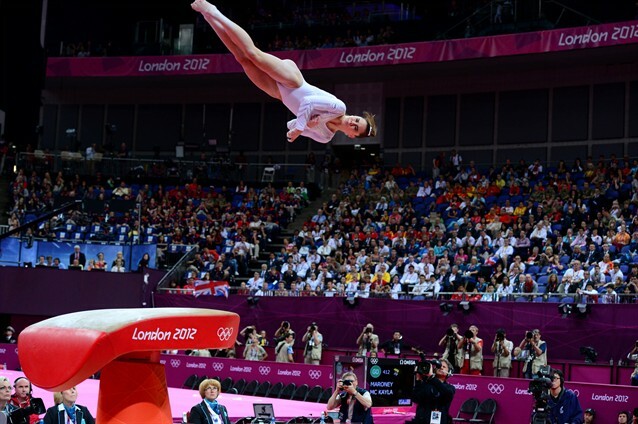 It said, "McKayla Maroney will attempt the Amanar vault." Obviously not written by anyone who knew anything about the competition, because in the gymnastics community, we know Maroney wasn't planning to "attempt" anything--she was going to PERFORM it. The "attempt" was made during the learning process. It WOULD be accurate, however, to say that Pena Abreu was planning to "attempt" a handspring double front, because I'm not sure she can actually do it! She sat it down in prelims, and no matter the difficulty rating, it's silly to be able to qualify with a missed vault. I get the feeling that each time she goes, it's just a crapshoot. She doesn't know if she'll make it, but she's not afraid to try. And that's a very dangerous precedent to set. I'm sincerely worried for her safety. Dwight Normile at IG suggested that a fall on vault should be deducted more than 1.0. And that makes sense; while a larger mandatory deduction would have cost Maroney any medal, it would have prevented Pena Abreu from qualifying with a failed vault. Finally, I am so happy that the legendary Oksana Chusovitina is getting the press she deserves. Check out the great article about her and 39-year-old Bulgarian Jordan Jovtchev.